The Mirage 2000 is a famous Dassault Aviation combat fighter plane, used by the French Air Force and armed forces throughout the Middle East. New Tech's Tiger brings that same excitement to kite flying! 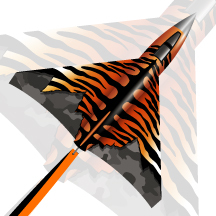 Sleek in design with a vivid color scheme and easy assembly, the Tiger will provide hours of aerial fun. Dimensions: W 45" x H 40"